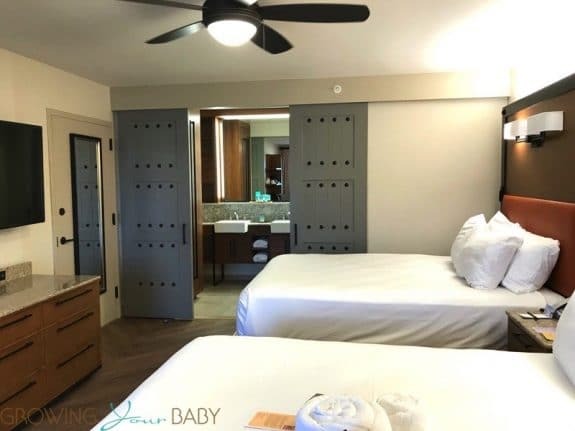 In February while visiting Walt Disney World we were lucky enough to be able to stay in one of the newly renovated Cabana rooms at Disney’s Coronado Springs Resort. This was our first time to this resort so we were excited by the bright, modern room. We are also fortunate to be placed in the 8A/8B Ranchos area of the resort which conveniently sits next to the pool! It is also a short walk to the WDW transportation hut that takes you to the parks. A moderate resort, we paid about $200US for the first night. We were traveling with Disney as part of their Social Media Moms conference so the additional 3 nights were packaged in with our conference fees and cruise. 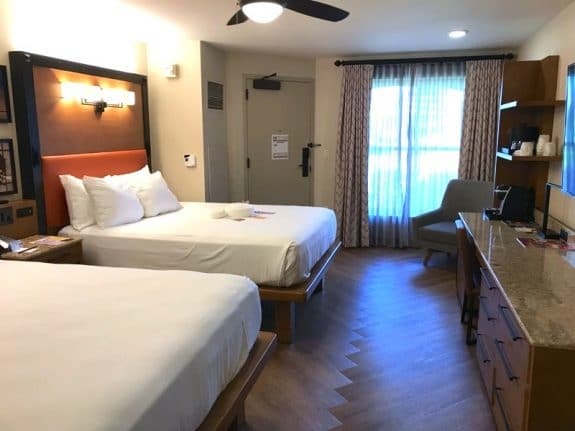 Disney has not yet updated their website with the new look of the rooms so we were pleasantly surprised when we opened the door. The room has a beautiful modern, airy look to it. To the left were two double(Queen?) beds with massive headboards. They have been upgraded to platform beds with a wide open space underneath so you can see if anything has rolled under. The floors are a gorgeous herringbone wood and all of the accent counters are granite. 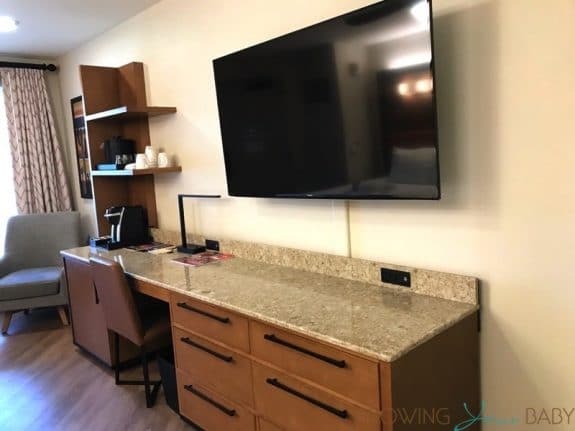 The nightable in the middle of the beds has enough USB outlets to charge all of your devices at once and there are even reading lights integrated into the headboards for storytime. The in-room safe is located in the middle of this table. The desk area is anchored by the massive flat screen TV. There are 6 drawers for you to store your clothes and an empty fridge on the left for snacks and bottled water(not included). I was pleasantly surprised to see a Keurig machine. We have one at home so it’s nice to know we can bring our favorites to brew in the morning when we come back. 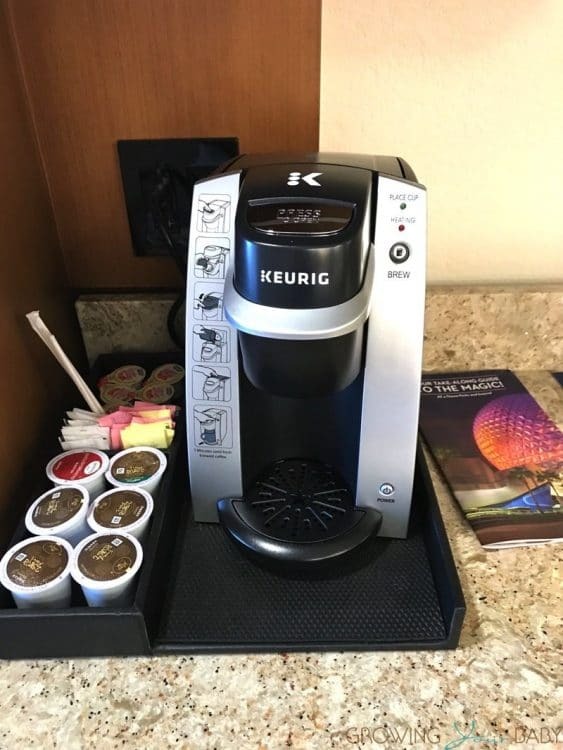 Disney provides 6 complimentary k-cups(2 decafs, 2 regs and 2 tea) plus some porcelain mugs to drink out of. The bathroom is separated from the sleeping area with barn doors. This is nice for getting ready early and not waking the kids. 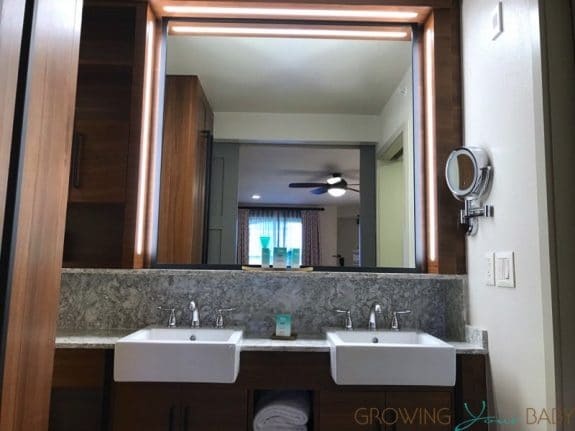 The bathroom is perfect with its double vanity, ample counter space, and cupboards. 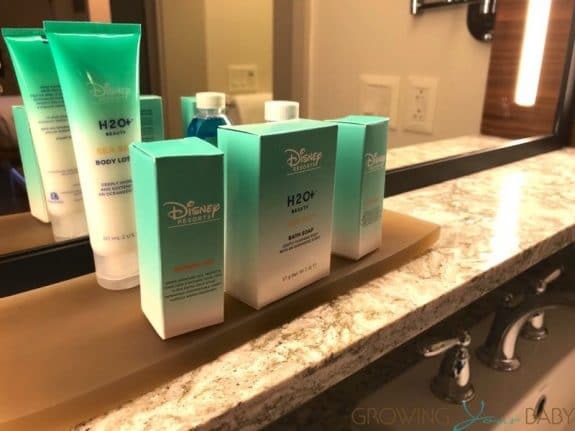 Disney also provides some toiletries as well as shampoo and conditioner in the shower. 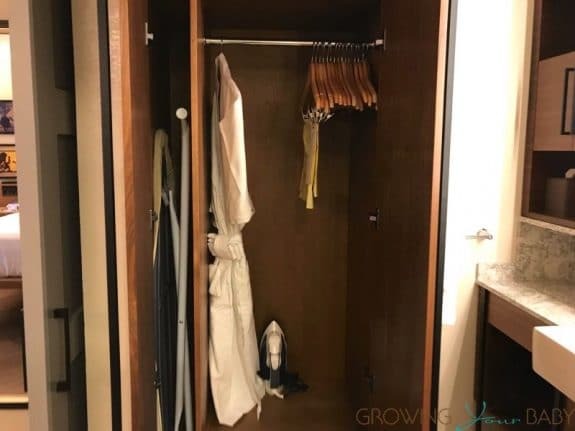 A traditional closet has been replaced with a stand-up unit that houses the ironing board, iron and robe. 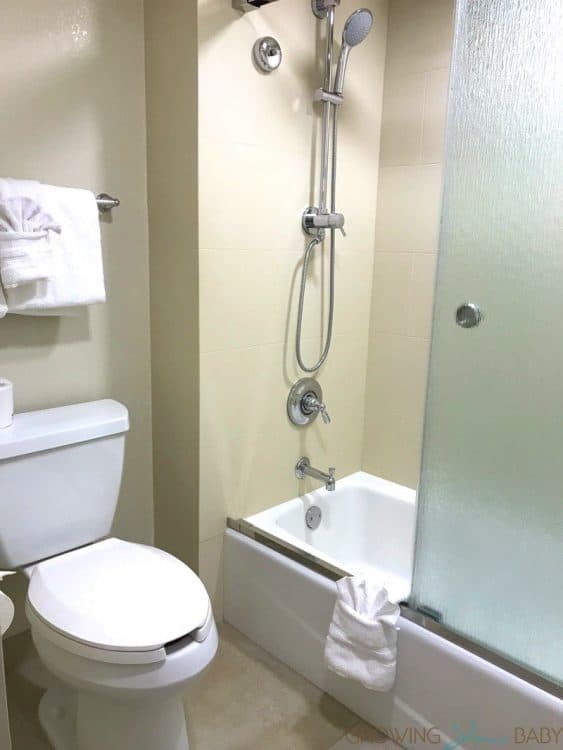 The bathroom has a toilet and the tub/shower with a rain head and detachable unit. It got chilly at night when we were visiting so my son loved coming back to the room, getting in the tub and closing the glass doors for extra privacy. 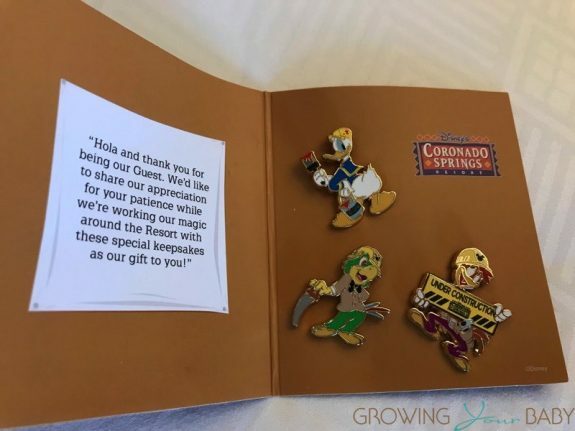 The hotel is currently under renovation and there is another building going up so they left us pins in the room which the kids loved and promptly took to the park and traded with the cast members. 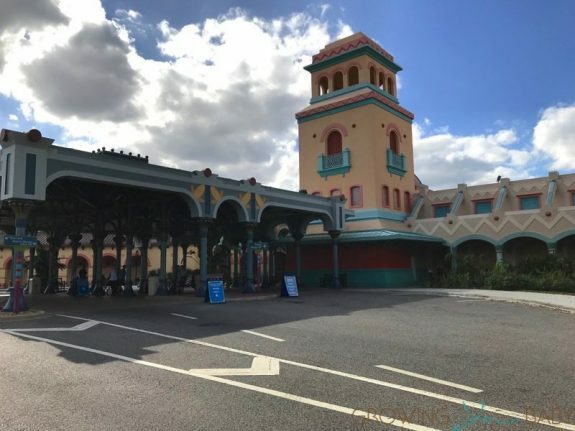 Coronado Springs is a great hotel for families who want to be close to the parks but don’t want to break the bank! Watch our site for a full resort review soon.